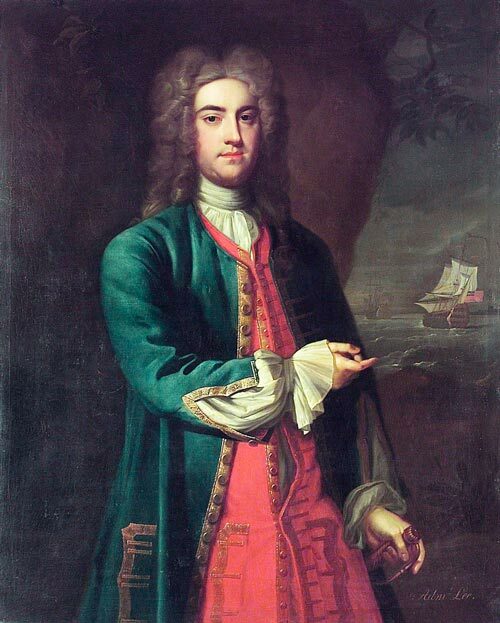 Fitzroy Henry Lee was born in Oxfordshire, England, c. 1698, the son of the Earl of Lichfield and Lady Charlotte Fitzroy, daughter of Charles II. Lee entered the Royal Navy in 1716 and was promoted lieutenant in 1722 and captain of the Falkland in 1735. Lee was commissioned Governor of Newfoundland in May 1735. His primary concern was the island's lack of justice. He recommended to the Board of Trade that people charged with capital offences should not be tried in England but on the island. Lee also suggested the establishment of a vice-admiralty court to discourage smuggling. He served as governor until 1737. During his term in Newfoundland and during subsequent naval duty in the Mediterranean and the West Indies, he became known for debauchery and drunkenness, seriously damaging his reputation. He was relieved of his naval command around 1746. He never served at sea again, despite his advancement to Vice-admiral in 1748. He died of palsy April 14, 1750.